I am sooooo happy to announce that my baby (now 7 months old) has finally gotten the hang of eating baby food. 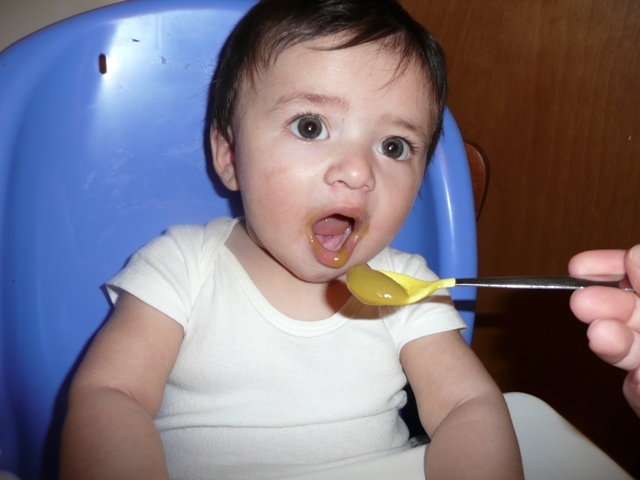 I don’t know if you remember when I wrote about 3 or 4 weeks ago and shared about what a challenge it was to get my baby boy to eat from a spoon. Well, I got lots of great feedback from all of your moms and I just wanted to say thankyou. It was not easy at all. Each day I had to deal with a huge mess from all the baby food that was spit out. I had to pry the spoon into his mouth as he clenched his gums refusing to eat. Most of the food wound up on his face, on his bib, and smeared all over the highchair. But I was determined. Every single day I sat him in his high chair and tried to feed him. Well, about a week ago, I sat him down to eat and I was shocked to see his mouth WIDE open waiting for me to pop the spoon into his mouth. I can’t tell you how excited I was. And ever since then, whenever I sit him down to eat he actually WANTS to eat and he opens his mouth so big it makes me laugh. I have been in Mommy Glory. Here he is, isn’t he ADORABLE? Oh yeah, FINALLY my 7 month old is EATING from a SPOON! I thought it would never come. 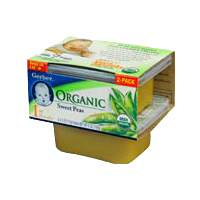 No more fighting, no more dreading – I can finally sit down and enjoy this baby food phase. Yes, there is still a lot of cleaning up to do, of course, but it is nothing in comparison to those few weeks of baby food frustration. So, am I the only mom whose baby didn’t start eating from a spoon until 7 months old? Am I the only mom whose child took almost a month of frustration to finally start eating baby food like a normal baby? Tell me your stories! Don’t forget, I have a pretty nice giveaway going on for jewelry from JNJ Collections. Be sure to check it out HERE. My son CJ didn’t want the dang spoon at all he wanted to eat with his hands. Later in life he says it was from watching a documentary on how Chinese Children eat the rice with their hands. We tried every day to get him to use that spoon we even changed colors, weights of the silverware but to no avail he wouldn’t, didn’t what it.